Micromax YU is the great hit in the Indian market which comes loaded with CM11 OS which is quiet dev friendly and overall it is priced at a very smart price which everyone can afford. The features offered by Micromax YU are really above the line at this price range! In today’s guide we will guide you to Unlock the Bootloader of Micromax YU after which you can install Custom Made CWM recovery and also get SuperUser on Micromax YU. The other posts will be followed soon. Do not forget to subscribe to the website in order to stay updated with Micromax YU guides. Not wasting your time anymore, let us now Unlock bootloader of Micromax YU. We have divided the tutorial in two parts- One is the Automatic Method using Informationlord’s Script and the other is via manual ADB coding method! Both are easy, just stick to the guidelines. Make sure that you have installed USB drivers for your smartphone. Now Extract the files using 7Zip or any other extractor. Enable USB debugging on Micromax YU and then plugin the USB cable. Run “Unlock Bootloader YU.bat” from the extracted folder and follow On Screen Instructions! Attach USB cable to your pc and then to your device. The LED near the speaker at the top goes red. As soon as the LED glows keep the vol up button pressed. You will see the fastboot screen. Download the same file which is posted above and extract it. This is all. 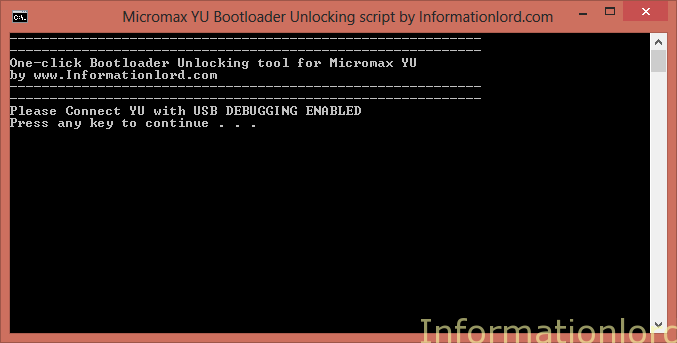 You have successfully unlocked Bootloader of Micromax YU. If you are struck anywhere, then feel free to comment! Do not forget to subscribe to the site in order ti receive other posts regarding Micromax YU. 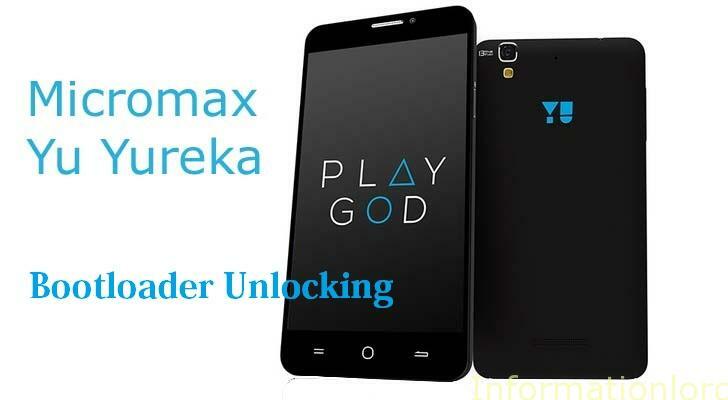 I have YU5510A Yureka plus on stock kitkat .will this method work on it and is there any risk of Bricking? Well, do not try the same with the files of Micromax YU. Or else you will brick your phone. Make sure you have all the adb drivers installed on your pc, prior noting down the commands! May i know for what can i help you for the same! Sir I can’t Enable USB debugging by the phone is unbrick from SD card. And boodlocker is lock pls tell how to unlocker the boodloader. Then adb device no data. And fastboot devices it show a no. and a word fastboot. You should flash the Stock ROM then in order to fix all the changes! i have tried every method given online to unlock the boot. using win-7 64 bit.tried updating drivers,disabling sign verification,updating adb ,fastboot.adb detects my phone and goes into fastboot mode but after that strucks at waiting for device.